Don't call it a comeback, but Sailor Moon Crystal delivered a strong episode this week, off of the back of a solid opening to the 'Black Moon' story line. The only problem is, is it too late for us to start caring? MAMORU WHY DO YOU HAVE A PUPPET OF YOURSELF. Seriously, this is just bizarre. Trying to cheer Chibi-Usa up, Mamoru whips this little Tuxedo Mask doll, complete with rose, out of nowhere. Like, seriously, it's a doll of your hero alter-ego. Why does he have it. What does he do with it when no one else is around. The mystery of Mamoru's creepy Tuxedo Doll is far more engaging than anything to do with Chibi-Usa. The real focus of the episode though, is given to Ami. Like the last episode's focus on Rei, it was welcome to see a Senshi that wasn't Usagi get the spotlight, and in such a short run time Ami gets more characterisation than she had in the first 14 episodes. Delving into Ami's backstory, her parent's divorce and feelings of abandonment as a child, her loneliness and self doubt, all serve to strengthen her character in the present. Her love of playing chess by herself, using it to clear her mind, speaks to the strength she finds in solace. She uses Mercury's affinity for water to help other people in an act of plumbing-related selflessness (although this seems like a really weird side-thing just to introduce villain of the week Berthier). We get a sense of what Ami is like as a person as well as a Senshi in a way the show has never shown before. It turns out, SMC may have learned that there are more characters in the series than Usagi and Mamoru. When Berthier seeks Ami out and challenges her to a chess match, she tries to use Ami's past as a distraction, her loneliness turned from a source of strength into a moment of weakness - and it almost works, knocking Ami's confidence to the point she nearly loses. 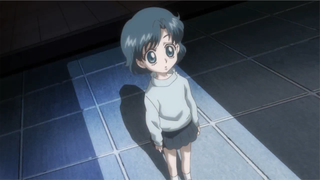 But a cry from Usagi in the audience of the match to cheer her on (much to the consternation of the rest of the audience) makes Ami remember that she has friends who rely on her, and that memories of times spent with the people she loves aren't sad aspects of the past to push away, but to acknowledge and find strength in. The 'I share a bond with my friends and I'm better for it!' mantra is a bit overused for Sailor Moon Crystal, but this is the first time that it actually feels earned, because it's not just thrown out there matter-of-factly with no evidence of it - and it actually helps Ami beat Berthier. It's a nice moment, and a culmination of what the episode actually achieved in fleshing her character out. Which makes it all the more frustrating that as soon as Ami feels like she's in a strong position, an actual character that has grown as a person, she's whisked away by Rubeus after a short fight between the Senshi and the Spectre Sister. It's frustrating that they left it so late to flesh the Senshi out that we're only really getting to know them as they get taken away from the show for extended periods, but equally frustrating knowing that Sailor Moon Crystal can actually make us care about its cast. Where was this characterisation in the earlier episodes, when everyone who was not Usagi or Mamoru was basically a cardboard cutout in a Senshi suit? It would've made Ami and Rei's abductions all the more impactful if we actually started caring about them as characters 5 episodes ago, 10 episodes ago, not just the episode in where they were captured. Instead, it feels like a reminder of how weak the series has been so far. But knowing that, if SMC sticks closely to the manga, we won't be seeing Sailors Mars and Mercury for a while, was it worth it? In the long run, yes - and it's something the show should've started doing a long time ago, and thanks to filler episodes, it's something the old anime could afford to do. We got to spend time with these characters not just as the Sailors, but as actual people. We got to care about them to the point that when something happens to them, it has an impact. In Sailor Moon Crystal, it just serves as a reminder, too little too late, of wasted opportunities in the show's first half that continue to linger even now.